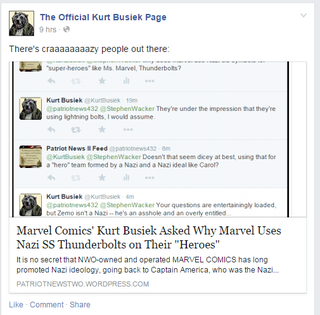 An extreme right-wing blog has accused Marvel, and by extension writer Kurt Busiek and editor Steve Wacker, of propagating Nazi symbolism and ideals through the Thunderbolts, Baron Zemo, and both iterations of Ms. Marvel. And being owned by the NWO. I thought that professional wresting organization ceased to exist a decade ago. Honestly, reading the “article” it’s SO badly written and researched that it appears to be satire. As far as I can tell though, it is legit... And utterly bizarre. It makes incredible links in logic, bizarre connections, and more. It’s a baffling read. Check out the “article” here. Smartphone Pliable → Avantages & Inconvénients !